This story starts with a borrowed Gordon and Smith "Midget Farrelly Stringerless" that I took for a spin courtesy of Sam at Taco Surf, and a fin box that had been ripped from a board and washed ashore in the cove at Tourmaline with the fin still attached, only to be found by Steve The Kneeboarder (see "Stoked and Broke" by Cyrus Sutton and Ryan Burch). When I got the board from Sam he mentioned that he didn't have a WaveSet fin for it, and the only one I had was a janky old warped one that came in a McTavish Tracker board that Bird had given me to make space in his shop for boards that actually work. I rode the board with that fin in it once and quickly decided that I wanted to try it with something that had a bit more snap than that old chunk of black rubber. Several hours of handwork later I had roughed out the old box into the shape of the WaveSet base, drilled a hole up front for the front mouting screw, and made a super special hold down tab for the rear screw mount out of a chunk of an old distributor cap from my Mercedes. It worked well enough that the wheels started turning in my head. If there's anyone who knows a thing or two about old surfboards, it's Bird Huffman of Bird's Surf Shed. "Hey Bird, do you think there's a market for an adapter for all these cool old boards with WaveSet boxes?" And so began a trip down a long path that is nearing its conclusion. 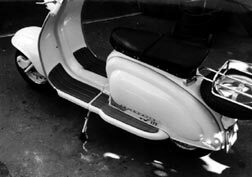 Back in the LambrettaWorks days we had manufactured some floormats for a very rare and valuable model of Lambretta, the first series TV175 from the late 1950's. One of my longtime best shop dudes and fellow Tourmaline regular John Sisson had some experience molding polyurethanes, and the TV1 mats became one of his pet projects. Because the original mats were so rare in decent condition, John spent many hours creating plugs to make the molds from. From there he had to make a mold box to pour the silicone molds into, with a lid that keyed into position so that it could hold the plugs in the proper position to later add some mounting fixtures that would be cast inside the finished rubber products. My part in all of this was primarily just advisory, but I did glean enough through osmosis and a little bit of hands on help that when it came time to create molds for the WaveSet parts, I was able to get started 80% from memory. The big difference between the two projects is that with the floormats, we didn't care so much about finished dimensions other than the mounting points. Concours judges can be pretty tough, but not to the point that they would notice that the floormats were a few thousandths off in one dimension or another! And it's these things that have made this such a challenge, given issues like material shrinkage, manufacturing and machining tolerances, and whatnot. * I am now on my third iteration of the mold, and I'm really satisfied with the bottom of the piece. I just had a new template made for the top of the plug, and it came out sweeeeet! They used white plastic with a black surface, and the logo really pops! (Not that this will show in the finished product; it's just a plug for the mold.) Next up is to make silicone molds of this top surface. I will do this by milling out the underside of the lid, affixing the plug with the new template to it, and pouring in the silicone. Now if only I could figure out a way to have the white accents! If you've got a classic old board with a WaveSet box, trust me, you're going to want one of these! Look for them in a shop near you soon.